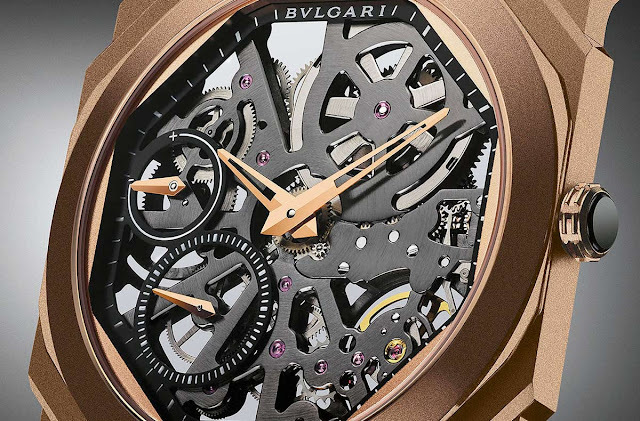 With a current over 400-strong workforce and integrated production of all watch parts spread over four sites in the Jura mountains, Bulgari Horlogerie has developed so strongly that now it fully masters the entire spectrum of watch mechanisms, with cases and dials also made in-house. Recently presented at Baselworld 2018, the new Bulgari Octo Finissimo Skeleton Sandblasted demonstrates the great skills of the Maison in designing and manufacturing exceptionally slim movements. It is not by chance that Bulgari holds several world records in the field of ultra-thin calibres. Dressed in a rose gold sandblasted case, the Octo Finissimo Skeleton allows the wearer to appreciate the beauty of mechanics by displaying the entire architecture of the movement, the hand-wound Calibre BVL 128SK powering hours and minutes as well as small seconds and power-reserve displays at 7 o’clock and between 9 and 10 o’clock, respectively. Its finishes include black-coated baseplate and bridges with circular satin-brushed decoration and chamfering. Offering a comfortable power reserve of 65 hours, this innovative 4 Hz (28,800 vph) skeleton mechanism is a mere 2.35 mm thick, making it possible to limit the total thickness of the watch to just 5.37 mm! The 40mm-diameter case features the distinctive sandblasted treatment which gives a silky touch and homogeneous aspect to the surfaces. 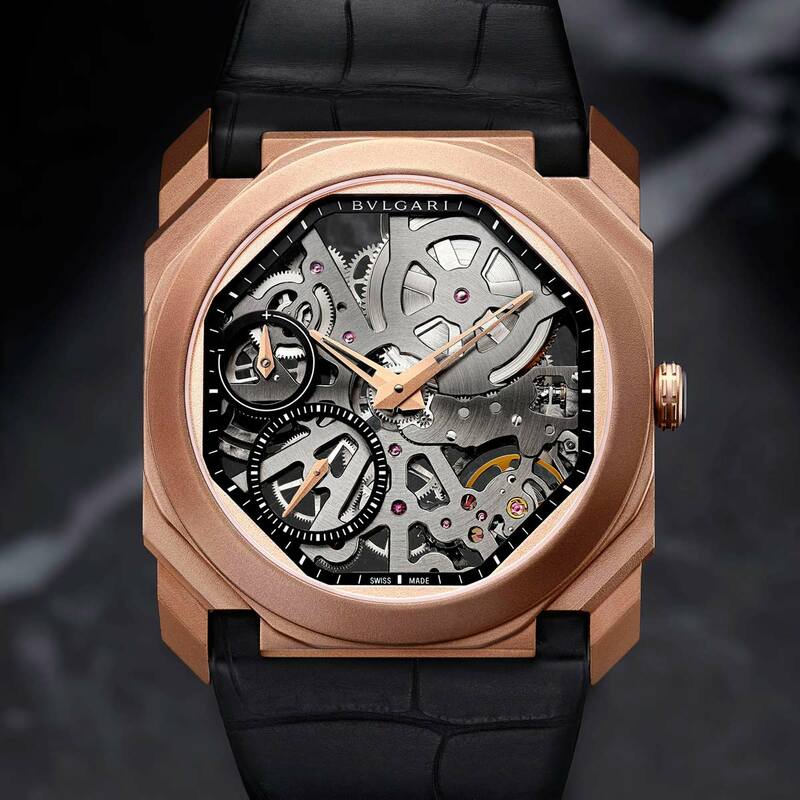 As the final touch, the screw-lock rose gold crown is set with a ceramic insert. Bulgari Octo Finissimo Skeleton Sandblasted. 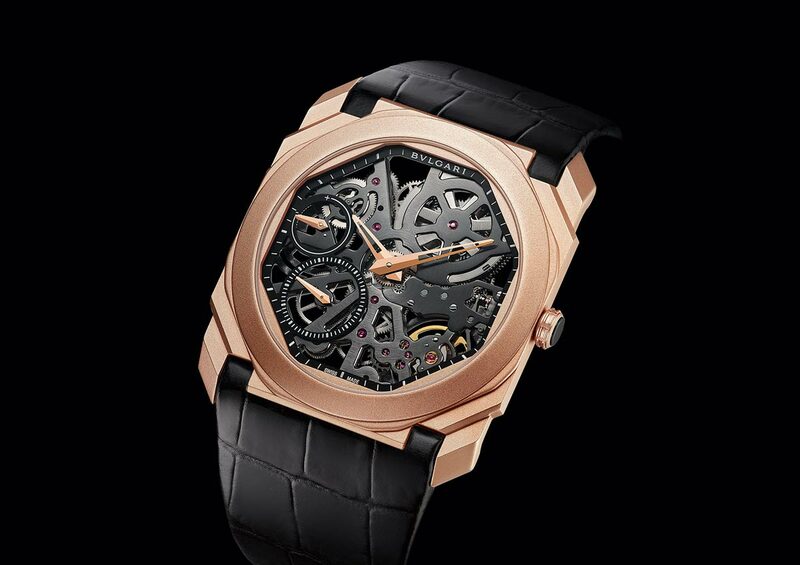 Recently presented at Baselworld 2018, the new Octo Finissimo Skeleton Sandblasted demonstrates the great skills of the Maison in designing and manufacturing exceptionally slim movements. 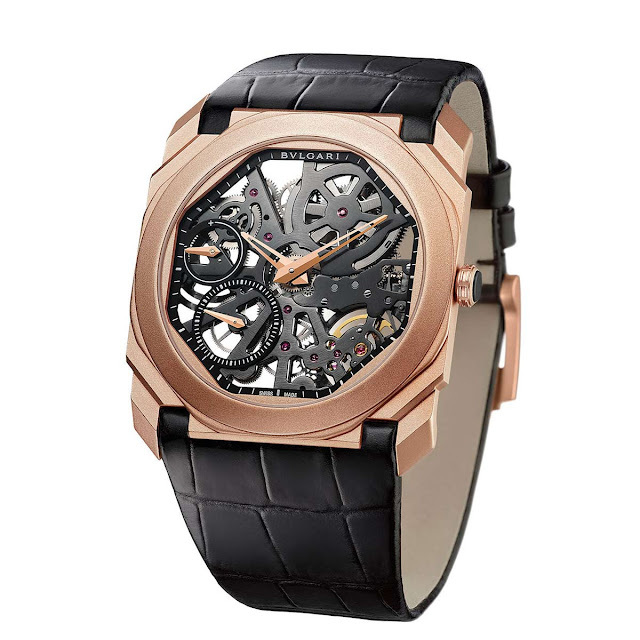 The price of the Bulgari Octo Finissimo Skeleton Sandblasted in rose gold (ref. 102946) is Euro 28.500.